Remember that video I mentioned last week? It's up and it's live! You can view it on the Sweet 'n Sassy Forum on Splitcoast. Here's the card I made for the video...Enjoy! I had the greatest time creating handmade gifts for Christmas this year! The only down side is that I had a lot of presents to create and I decided to start making them about two weeks before Christmas...umm...what is wrong with me??!! LOL! I've share a few projects so far and this is the next one on the list! This was a great quick and easy projects but I really liked the end result. 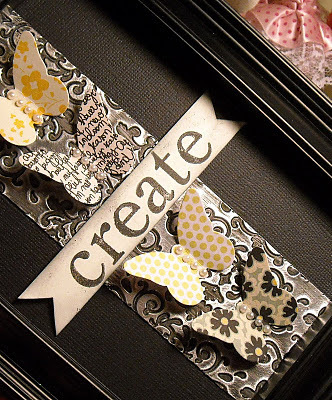 Once my decorated metal was attached to a piece of black cardstock I added punched butterflies, from a Martha Stewart punch, to the front. Tiny pearls make the perfect butterfly bodies! 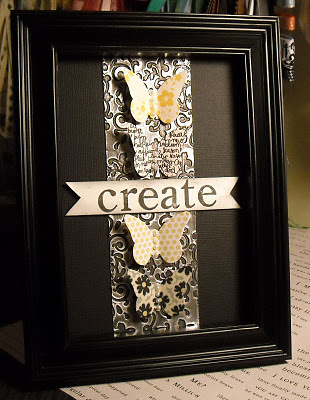 The paper "create" banner was made using PSA Essentials stamps and was then attached with foam tape. This does have some dimension to it so I removed the glass from the frame. You could also create this same kind of project using a shadow box. 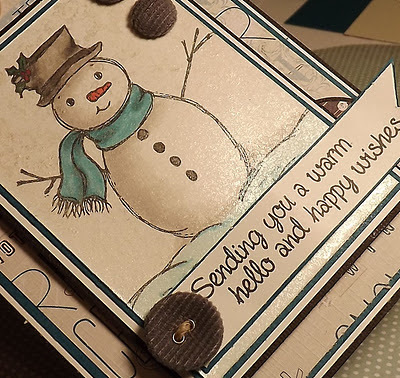 Someone has a video (hint, hint, it's me) that will be posted on the Sweet 'n Sassy Forum next week (January 31st to be exact) and this card provides you with a little hint about the tutorial. Any guesses?? 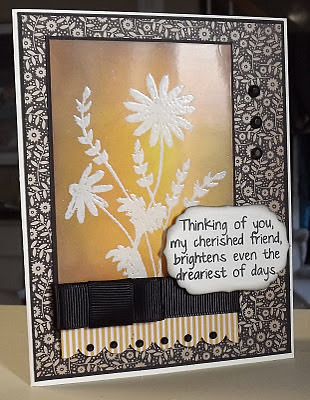 This card was created using the Serene Silhouettes stamps set (the sentiment is from the Wildflowers set) from Sweet 'n Sassy. I used two different colors of green and pink to stamp the grass and flowers. I like starting with a light ink color when stamping my first image and then come back and layer either the same image or a different one on top. This creates some great dimension! And using lighter ink colors allows you to stamp your sentiment over part of the image. I love that look! The fun notebook portion of the card was created using a die from My Favorite Things. 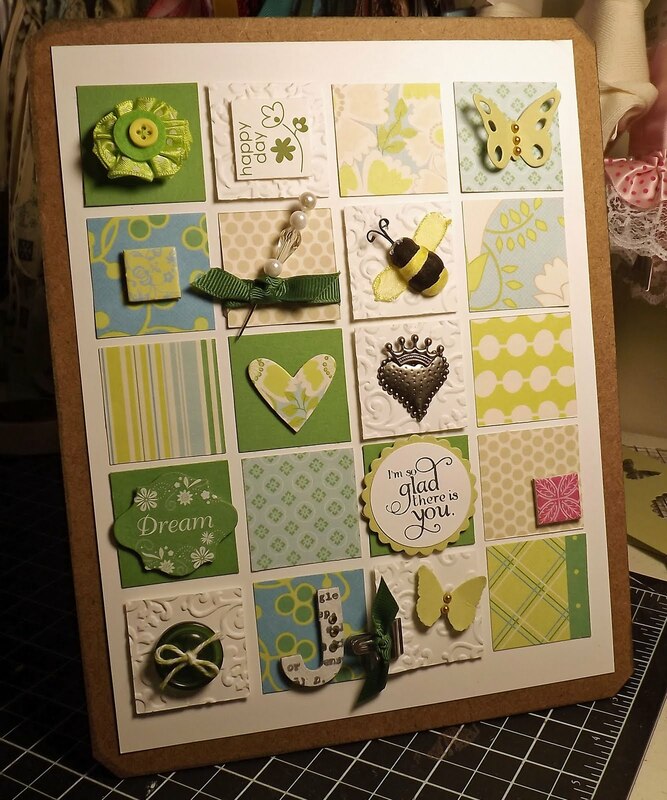 The pale green polka dot paper is from We R Memory Keepers (did you know they make paper? They have beautiful designs!) 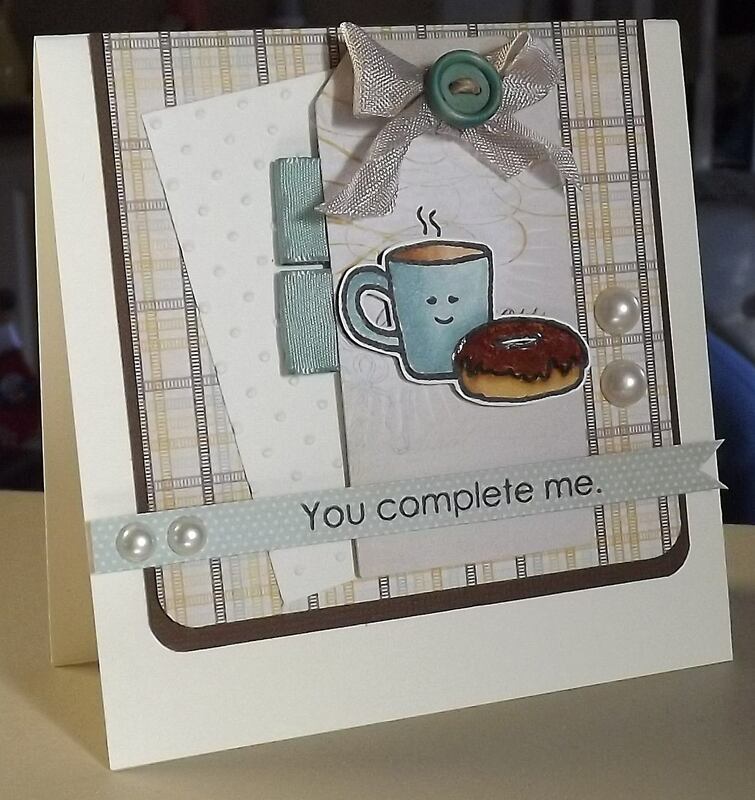 I finished off my card with a button and twine (the twine is also from Sweet 'n Sassy). Enjoy and be sure to visit out Forum on January 31st for our latest tutorial video! Is it too late to share another Christmas project? I mean this could spur you on to get those homemade ornaments done early, right? :-) The reality is that I'm painfully behind on my blogging this week, even though I have a ton of projects in the works. Is anyone else like that out there? One week I have a ton of projects lined up to share and then the next I'm busy working on projects but nothing ready to share! It's feast or famine!! So on to this precious angel! Isn't it the cutest!! This is an idea I found on Splitcoast, a project found here (in her posting there is also a link with directions). I used a circle cutter to create the circles to form the body. The arms were created by using half a circle for each arm. Once the circles were cut out I stamped all over them with snowflakes from the fabulous Snowflake Flourish stamp set from Sweet 'n Sassy. I then added just a thin line of glitter around the bottom edges of the dress and arms. (Oh, the "arms" were hot glued onto the body) The head is made from a small ornament. I drew the wings (a template is available from the SCS link, noted above) and the completely covered them with silver glitter...oh the bling! The finishing touches were tiny beads for a hallo and a few pieces of ribbon. This was a super easy project and there are so many options for decorating! I gave this as a present to someone that I work with but I thought that this would be a great gift for a few friends next year as well. 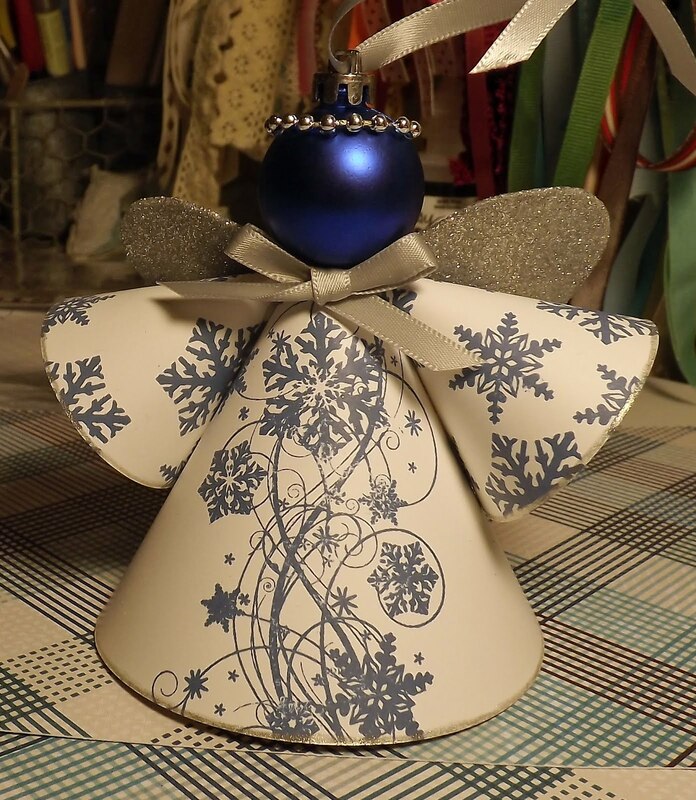 Who wouldn't love handmade ornaments! Enjoy and be sure to check out the tutorial on SCS! Hi there! Welcome to the Sweet 'n Sassy Friday Feature, which is an opportunity for us to share stamp sets that were released some time in the past. What a great reminder of all of the wonderful Sweet 'n Sassy sets! 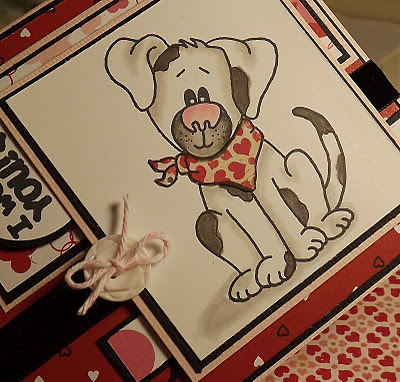 Today's Friday Feature is this darling puppy from the Woof You set, which comes with this sweet little dog image, four sentiments, as well as a bone and puppy prints!! So cute! I decided to turn my card into a Valentine's Day card for my hubby!! (This is a great set for creating those manly cards!) I added some spots to my puppy image using a fine tip marker from Copic. The paper I used is from Bo Bunny (I'm totally digged V-Day paper this year!) I paper pieced the bandana, using more heart covered paper from Crate. The button is from Papertreyink and the twine is from Sweet 'n Sassy! 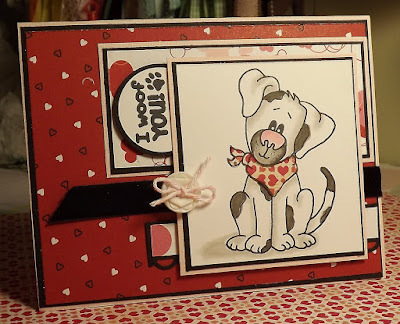 Enjoy today's card and be sure to check out all of the Woof You cards over on the SNSS blog! Oh, and the layout is this week's Sweet Stop sketch, you can read about the weekly challenge here. Do you know about the Card Positioning Systems (CPS) sketch challenges? If not, you should check out their site! Each week a new sketch is posted and you can be entered into a prize drawing if you participate by submitting a card using the sketch! 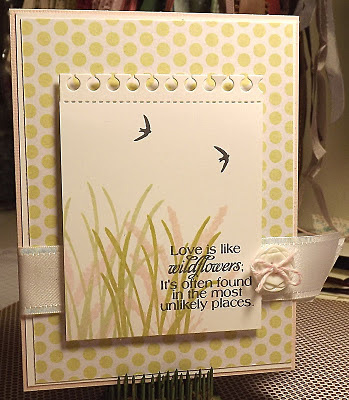 This week the sponsor is Sweet 'n Sassy and I'm pleased to be able to share a card using this week's sketch! Be sure to hop on over to the CPS site to learn more about the prizes that are available this week! For this card I used a brand new Sweet 'n Sassy set, Warm Hello. Isn't that snowman adorable! I definitely have a thing for snowmen in the winter...hummm...maybe because I live in the great white north where we're typically surrounded by snow! Before stamping my image, I sprayed the cardstock with Perfect Pearls for a great shimmery look. I just feel like you need a little something extra when you're dealing with a mostly white image on a white background and Perfect Pearls is the perfect solution! The image was then stamped and colored with Copics. 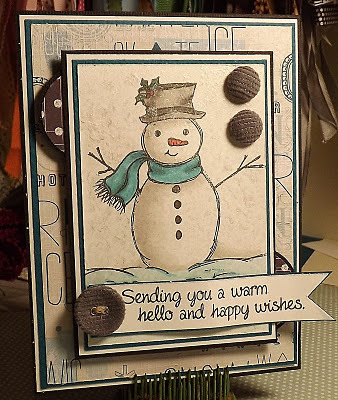 My snowman is paired with this lovely wintery paper from Little Yellow Bicycle and grey fabric-covered buttons from SU! Enjoy today's card and be sure to check out the sketch at CPS! Hi all! 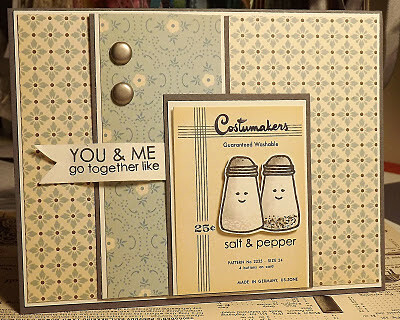 I'm sharing a card featuring this darling stamp and sentiment from PSA Essentials. Isn't this the greatest sentiment? I laughed out loud when I first read it! 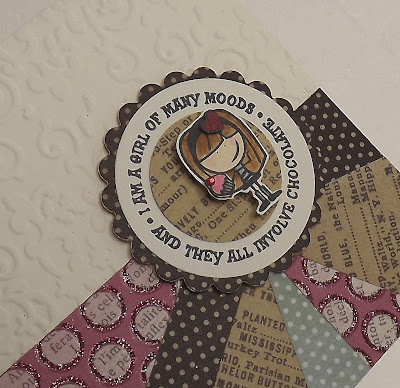 The card layout is from a publication call (I didn't make it but now I can share my card sooner rather than later!) 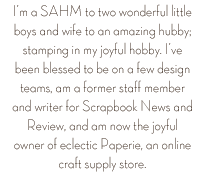 and it's a great way to showcase lots of fun designer papers! All of these papers are from My Minds Eye and I love them all! For the image, I stamped it twice on cream cardstock and colored them with Copics. I cut out one entire girl image and then just the heart and cupcake from the second image and then attached both of them with foam tape. I attached a tiny red rhinestone (from Taylored Expressions) to the top of the cupcake. 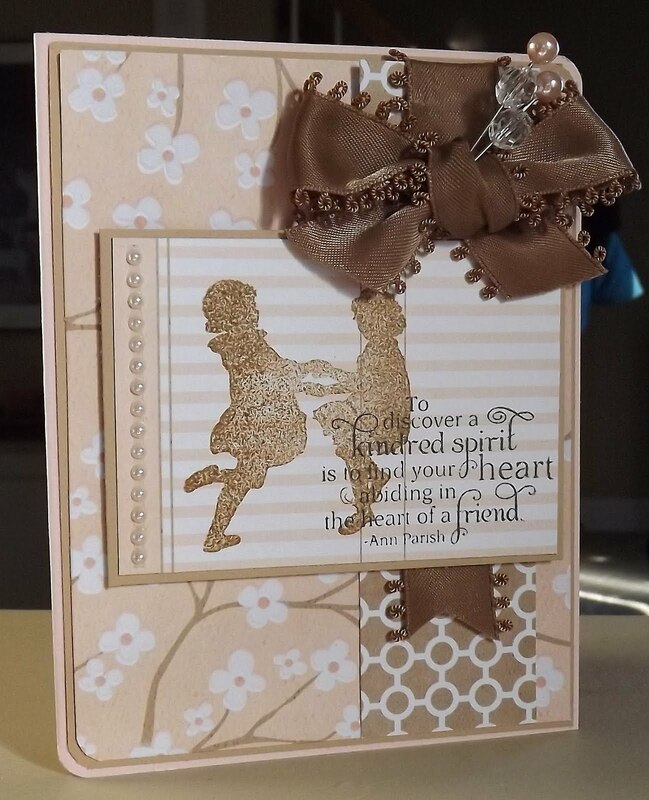 The background of the card was embossed with a folder from Sizzix. Enjoy and check out all the great stamps from PSA! Happy Monday everyone! 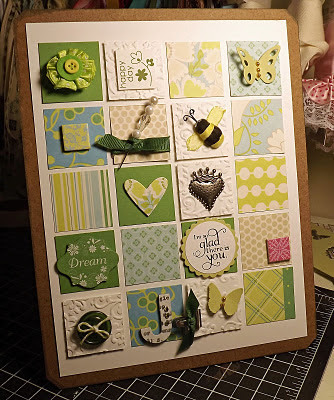 I have a card posted on the Sweet 'n Sassy blog today...Head on over to check out all of the details! Psst...did you know that Korin is now the Splitcoast Card Sketches Queen!! Seriously, how exciting is that!! Two of my favorite SCS challanges are the CAS challenge...and...wait for it...the sketch challenge! Nothing makes me happier than a good sketch and Korin always does an amazing job with sketches! I'm so excited for her and Sweet 'n Sassy!! Since I had a few minutes last night I knew I had to sneak away and create a card for this week's sketch. (Check out all the details here and participate with us this week!) 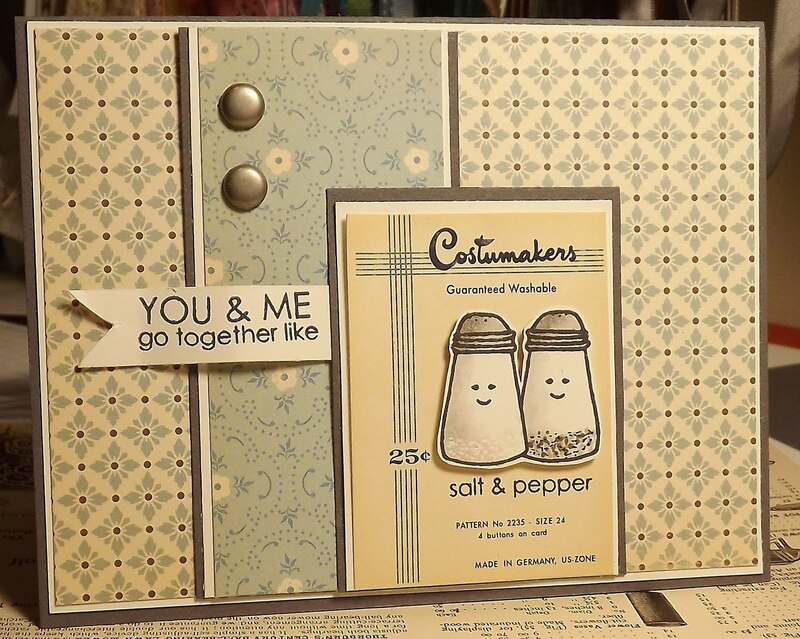 And I had to use this darling, and I do mean darling, new stamp set from SNSS called You & Me. 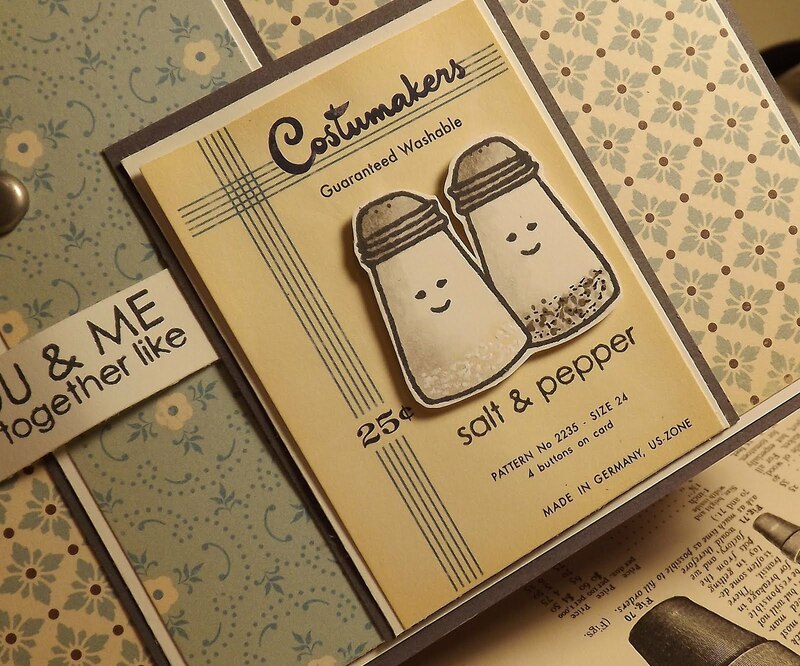 I just love the cute images with their tiny faces and the sentiments in the set are so much fun! I stamped the S&P shakers on a separate sheet of cardstock, colored them (and following Cathy's fabulous idea) I added a little salt and pepper to each container! I then cut them out and attached them to the little card with foam tape. 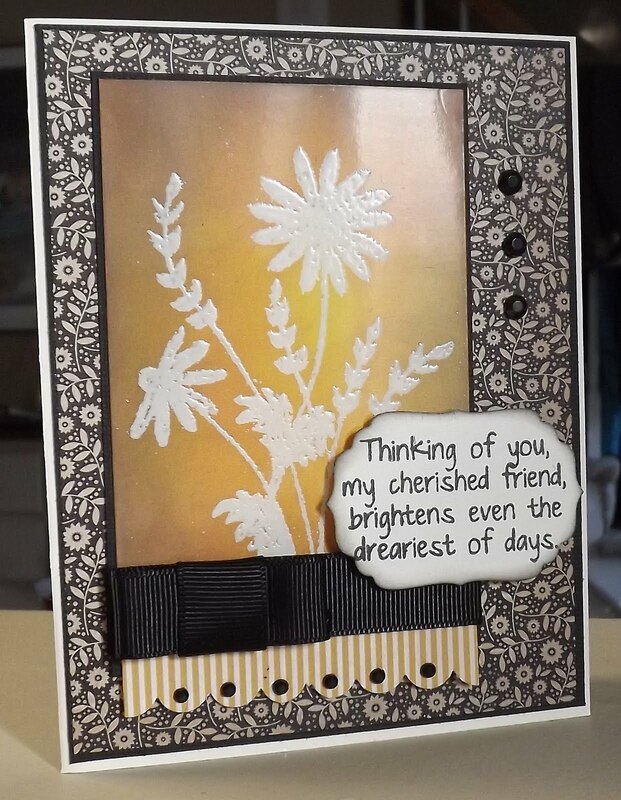 (I stamped the image on the card so the sentiment would be on the card and then placed the colored shakers on top of the stamped image). Then I simply added the You & Me sentiment and a few brads! Fun set, fun card, and fun sketch! 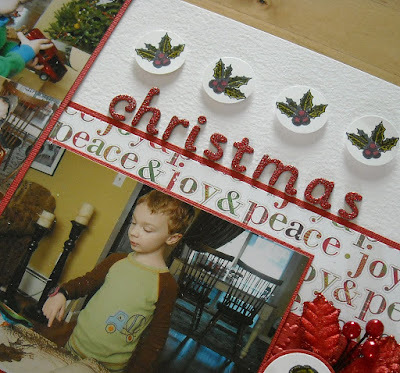 It's day two of the holiday scrapbooking posts! 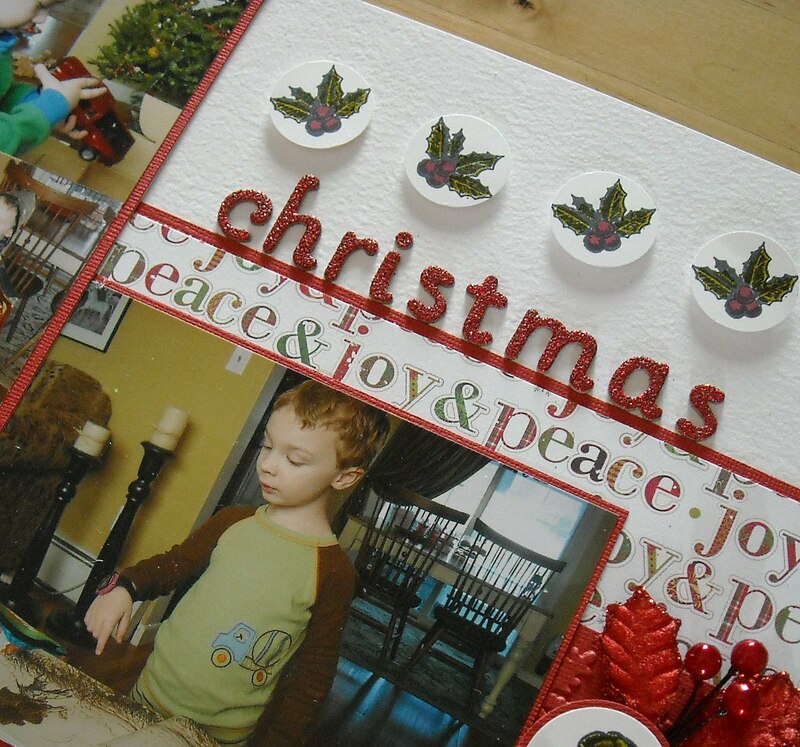 :-) This layout is on the PSA Essentials blog this morning and when reading the write up that Libby posted I noted that she made a great point; scrapbook those Christmas memories shortly after the holidays. If we wait too long, we tend to forget some of the more precious things that were said or done. This year I am taking this advice! My photos have been shipped from my favorite online printer and my album is already finished, just waiting for the addition of photos and embellishments. I can't wait to share! Of course this photo isn't from this year...it's from 2008! Nothing like going back a few years to scrapbook! However, I loved this photo of the boys and knew it would be perfect to highlight on a page. And in 2008 we had quite a time getting a good photo. We all ended up laughing hysterically, some of us (little boys) crying and whining, some of us (me) giving up, and some of us (my husband) finally capturing the perfect photo! Our Christmas card that year showcased some of our outtakes, such as my youngest sticking out his tongue, both of them looking completely exasperated, and one of them with their heads down on the arm of the chair, all done with posing! On this page I used a number of PSA stamp sets; I created my own designer paper by stamping snowflakes all over a piece of cream cardstock. A number of holiday images were stamped, colored, and attached to small circles, which acted as perfect embellishments, and the 25 was highlighted on a few layers of cardstock and designer paper. The designer paper is from Imaginisce, ribbon is from May Arts, and the date and sentiment stickers are from Jillibean Soup. 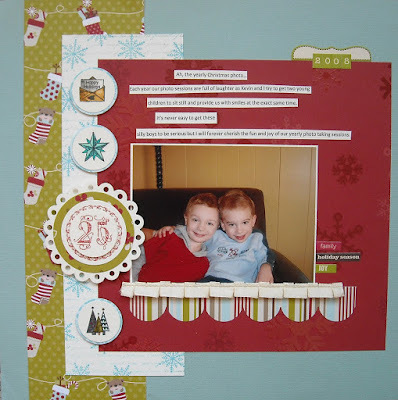 I know, Christmas is over and the last thing you want to think about is wrapping another present or picking up more pine needles, but how about scrapbooking those precious holiday photos! 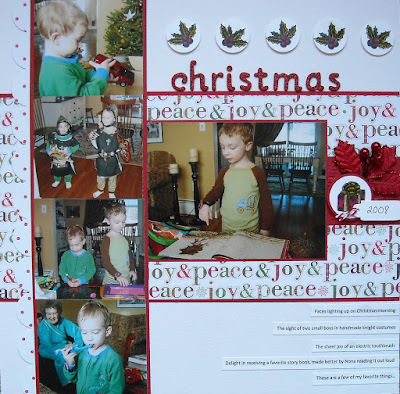 It's definitely time for scrapbooking and today I'm happy to share this layout, featuring PSA Essentials stamps, of one of our Christmas mornings from a few years ago. 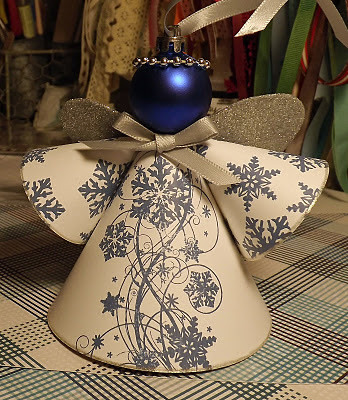 The designer paper I used is from Little Yellow Bicycle and the fun sparkly holly is from Petaloo (love their designs!) The present and holly leaves, all in circles, are from PSA. 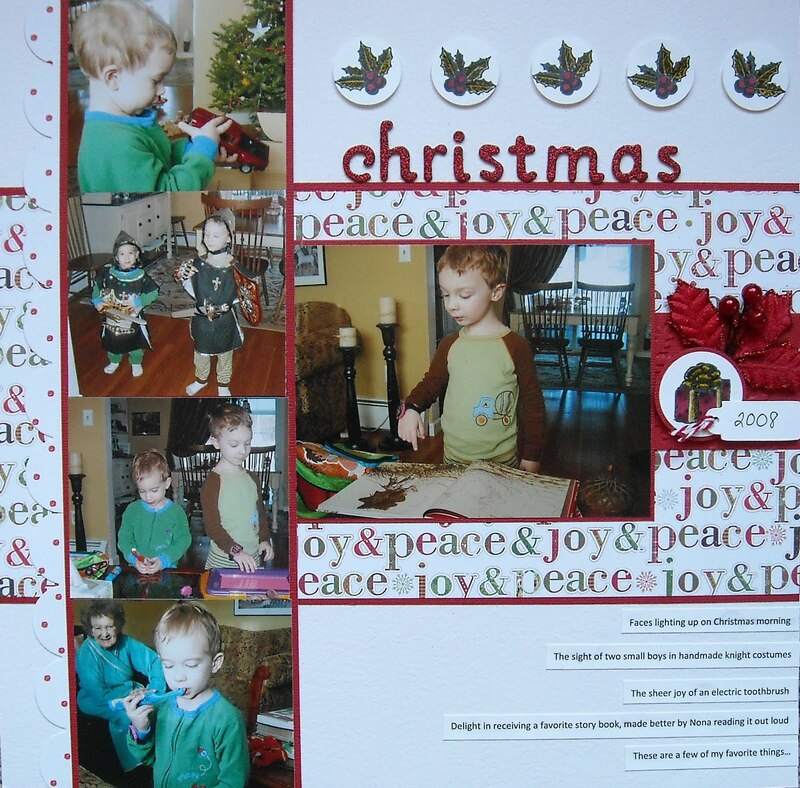 This was a fun layout, one I found in a book I think, and perfect for showing off multiple photos. My goal for pages is to complete 2-4 pages for an event and then put the remaining photos in standard photo sleeves. This allows me to create scrapbook pages much more quickly as I'm only scrapbooking a few photos. This page was perfect to capture some of the highlights of our 2008 Christmas; Cooper's obsession with his electric toothbrush (even trying to steal his brother's toothbrush), my grandmother from NY being with us, Carter delighting in one of his favorite story books, getting his first watch, and both of them modeling the handmade knight costumes that I made for them that year. The plastic swords and shields over paired with their jammies was fabulous! 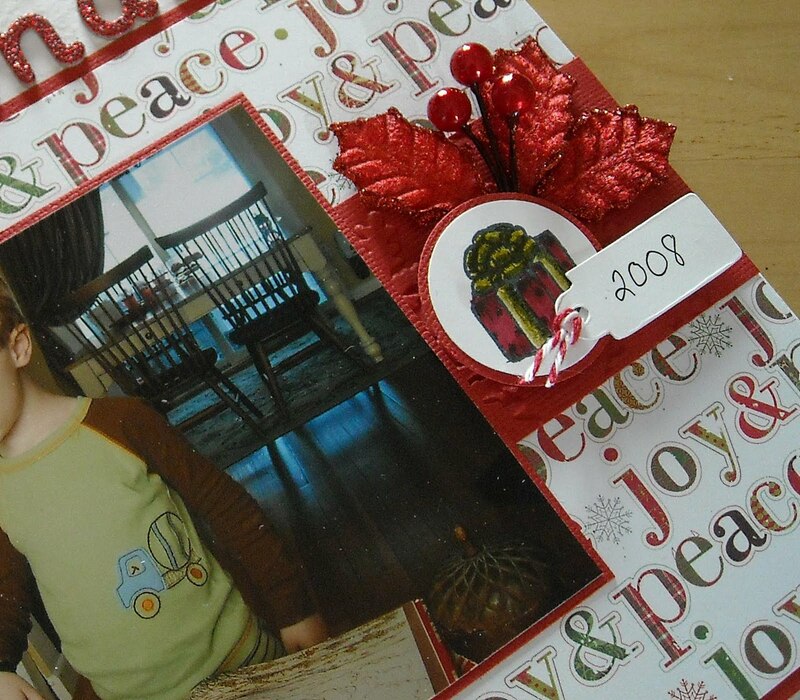 This is definitely one of the greatest joys of scrapbooking, being able to go back and relive those precious memories. 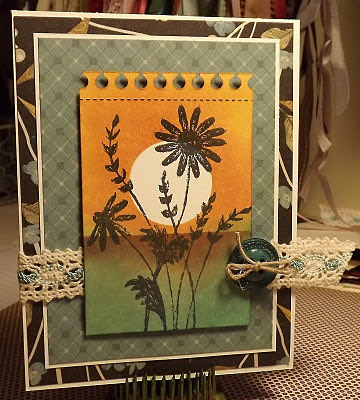 Enjoy and be sure to check out their PSA Essentials blog for more beautiful work featuring their stamps! Sweet 'n Sassy Release Day! 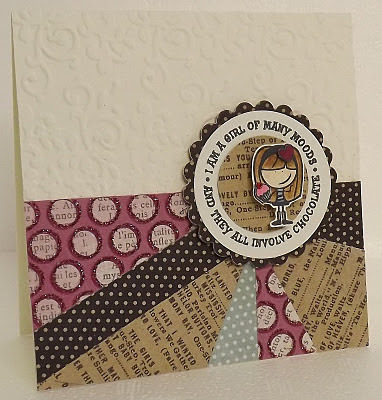 I'm so excited about this month's Sweet 'n Sassy Stamps release, it's amazing!!! Eight new clear stamp sets and three new sets of dies will be available in the store tonight. Make sure you've got a warm, tasty beverage and some donuts ready....you won't want to miss a bit of the inspiration we have for you today! To be honest, I had the hardest time deciding which project to share because I LOVE each and every set that we're annoucing today!! (EDITED: I decided to add the second card, using the You & Me set!!) But I had to go with the card above because I just adore silhouette images and this new set, called Together Silhouettes, is no exception! 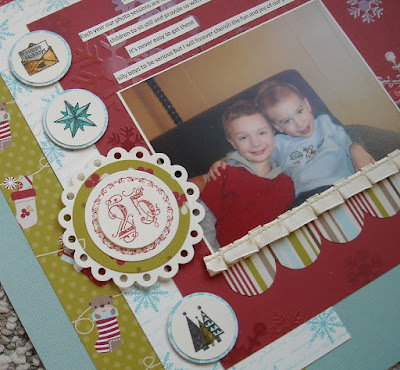 I paired the images with this beautiful paper from We R Memory Keepers and ribbon from American Crafts. 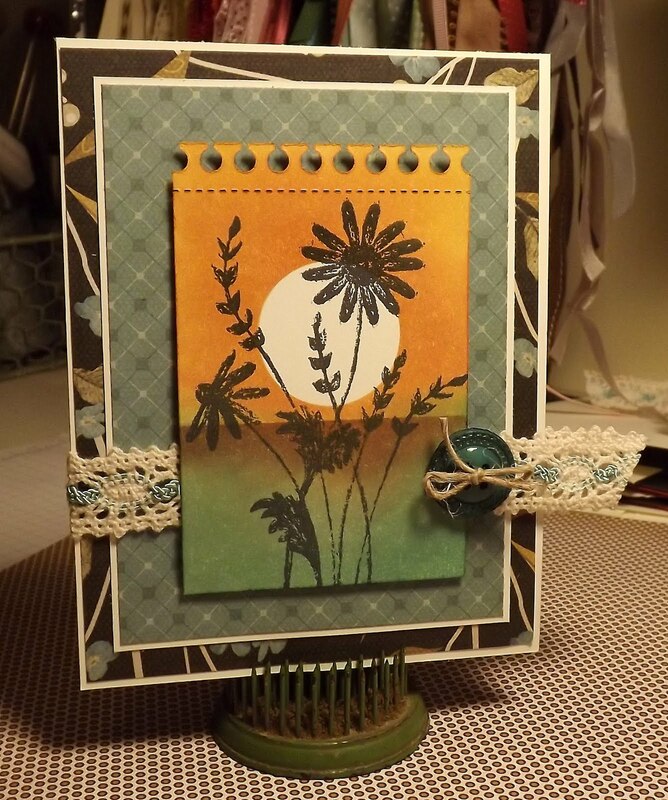 I also added two stick pins adored with glass beads...a perfect accent for this vintage looking paper. For my second card I stamped the images and cut them out so that I could pop them up on the mini tag. And seriously, are these not the cutest images and sentiments!! Love them! (I even added some glossy accents to the top of the donut so it looks just like glaze!) The fun paper is from October Afternoon and the seam binding is from The Cat's Pajamas. Enjoy!! And now take a look at the rest of the Design Divas (and our very special January guest)...they've all whipped up some gorgeousness today! 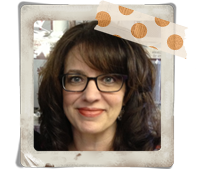 We hope you can make plans to join us tonight in our Member Company forums over on Splitcoaststampers. We're having a Release Party, and it is full of great activities, stamp set reveals, and fun with friends! All of the partying will take place in our Release Party forum, so be sure to bookmark it! Hope to see you there! Greetings! I'm back today to share another one of my handmade Christmas gifts! (Forgive the major glare on these photos...My sweet hubby bought me a brand new, fancy camera for Christmas and I'm still figuring out how to use it!) 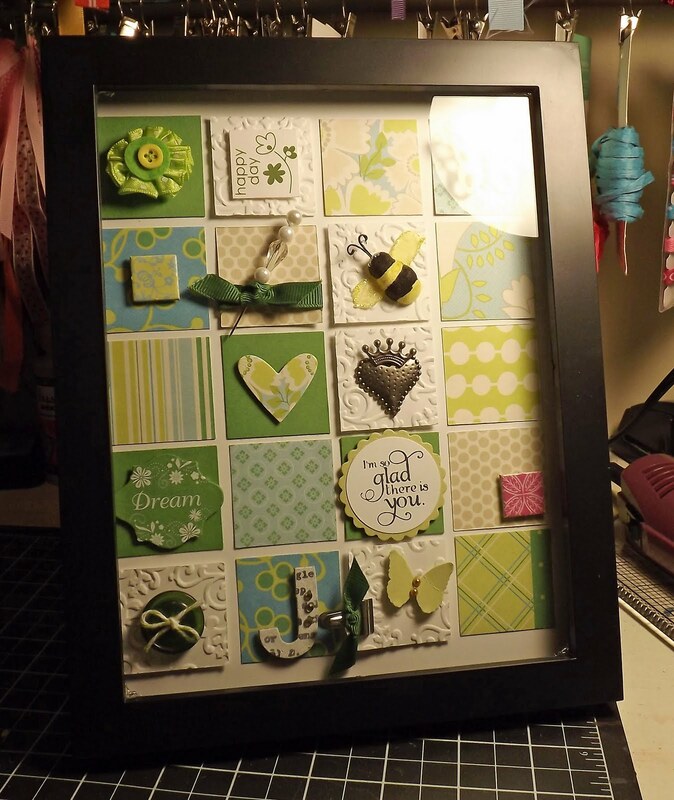 This is a gift that I made for a friend of mine that I've made through working and teaching at Wholly Scrap! Isn't that so much fun...not only do we have great customers but we have great friends that are also customers! Working in a scrapbook store is just about the happiest place on earth!! The picture above is of the finishsed piece, in the frame, which also includes that lovely glare! Ugh...Below is the piece out of the frame so it's easier to see all of the fun pieces. I created two of these (will share the other one in a few days) and they were both so much fun to make! 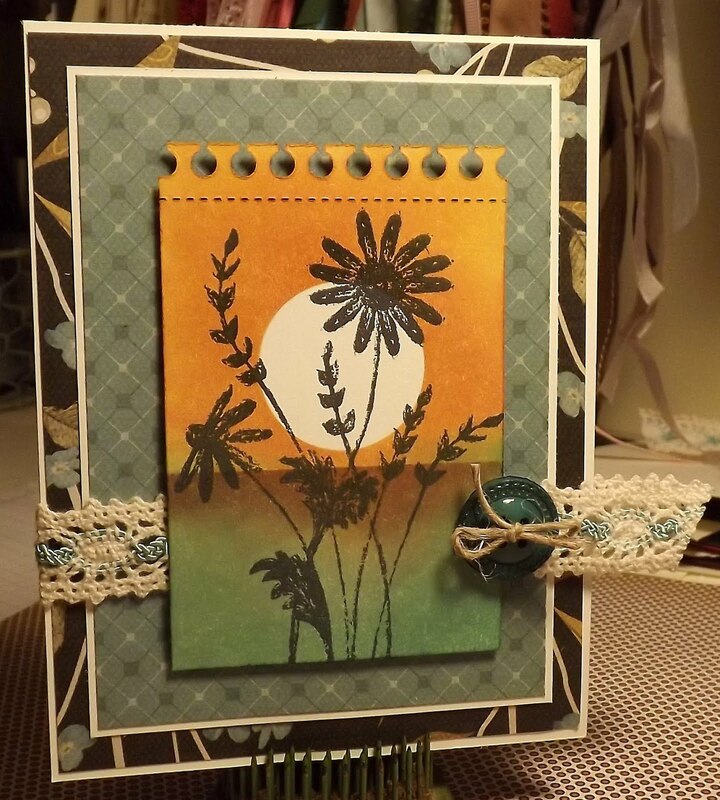 I started by finding coordinating decorative papers and then using three plain pieces of cardstock that worked with the colors in the DP. I then cut each square down to 1.5" and laid out the entire design, mixing the DP and plain cardstock, on my work space. Once the papers were cut, I got to decorate all of those little squares! I added buttons, letters, die cuts (heart and butterflies by My Favorite Things), stick pins, flowers, ribbon, and rub ons! 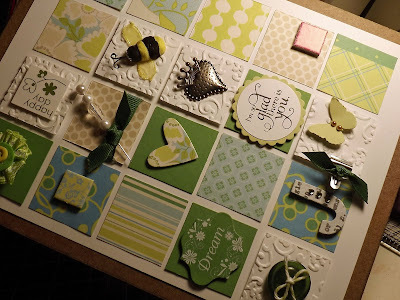 Then each little square got glued to a piece of white cardstock. To create this you'll need a shadown box so that the popped up pieces don't get squished. I really enjoyed creating handmade gifts this year...so satisfying and enjoyable to give gifts from the heart and your own hands! Enjoy and be sure to check back in tomorrow for the big Sweet 'n Sassy release day reveal!! I can't wait!! Happy New Year everyone!! We had quite a New Year celebration...complete with two sick kids, a husband who needed stitches in his finger, and a serious lack of sleep! Goodness, what a start to 2012!! I'm praying that the rest of the month is a bit calmer! 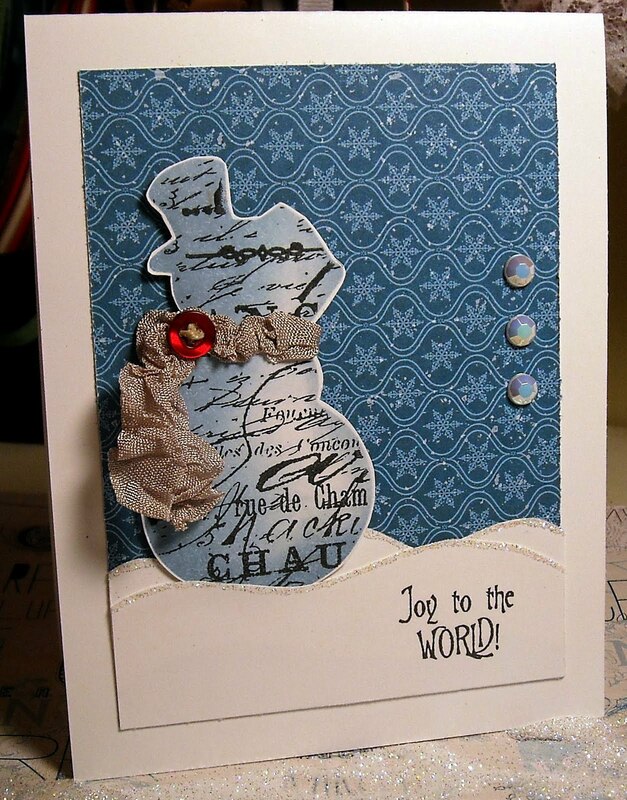 I created the snowman by using the Tim Holtz snowman die and then added color with Distress Ink. 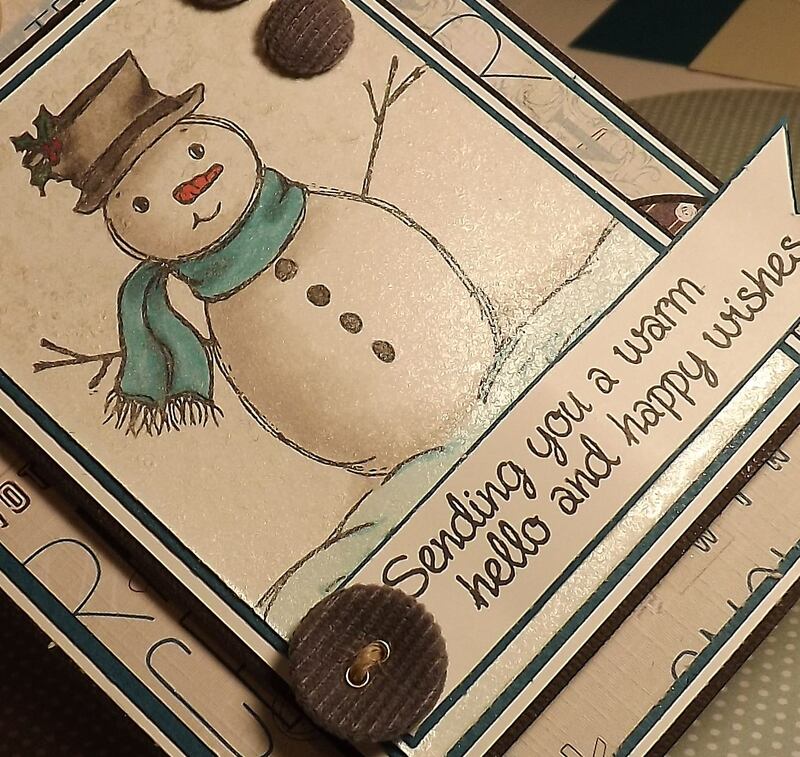 I used a script stamp, also from Tim, to add more design to the snowman. The hills were hand cut and I used a Quickie glue pen to add a tiny bit of glitter to the hills. The scarf is seam binding from The Cat's Pajamas (love this stuff!) and the button is from Papertreyink. **Tip** I was able to get that crinkled look on the scarf by spraying water on the ribbon and scrunching it tightly into a little ball. I then carefully used my heat gun to dry the ribbon. When the ribbon is completely dry, it remains crinkled...love it! The designer paper is from Little Yellow Bicycle and the sentiment is from Sweet 'n Sassy. Enjoy and best wishes for 2012! !